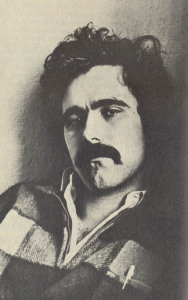 Yeah, as far as I know, this is the only photograph of ’60s underground filmmaker Ron Rice on the web, which I scanned from Sheldon Renan’s book An Introduction to the American Underground Film. I don’t know why there aren’t any photos of Rice, but I thought I’d post this up in case anybody’s interested. Feel free to disseminate so that the title of this article becomes obsolete. Click the above image for a larger version. Rice, though, did die at a very young age. He was only 32 in 1964 when he passed away from complications from pneumonia in Mexico. Sadly, he only made four films, but they made an incredible impact on the underground scene. Only his last film, Chumlum (1964), has officially been released on DVD, which you can find on the Treasures IV: American Avant Garde Film 1947-1986 box set. It’s an extremely colorful, vibrant film, shot while the actors for Jack Smith‘s Normal Love were just lounging around and relaxing between takes. You can see a picture from that film here. There are no pictures of Ron rice because he only has this picture & a few more of when he was in the US Air force, I know because his only sibling is my late wife Cynthia Rice, I’ve got a lot of stories about him & some original memoribila like scrap book , film books etc. I would very much like to know about his family, meaning his wife and child. We are friends of his aged widow and would like to know with whom to communicate regarding her welfare. If you can be of any help, we would be very grateful. I knew both Ron and his wife Amy, in Mexico. I was in Acapulco during his visit there that resulted in his death from pneumonia and in my opinion, methedrine. I didn’t know her well, but she seemed like a sweet woman who deserved better than one very cruel episode I witnessed. I know nothing about his family or how to reach them. I’d love to speak with you about your late brother in law. We are currently researching the possibility of opening a museum of American underground artists and Ron would certainly be included. Any memorabilia that you would like to sell would be wonderful. Thus far we’ve only located a few photos that he took while filming the Flower Thief. Please contact me at: osamahalliburton@gmail.com. No, The Flower Thief has never been released. Even the cult underground video sites don’t even have unauthorized copies. I’ve never seen it myself and I’d love to someday. Shoot, that would be before my underground film consciousness really began. I haven’t heard of Arthouse before, but maybe somebody else I know has heard of it. I’m going to keep my eyes and ears peeled. I was just thinking Flower Thief wasn’t around cuz places like Sub Cin nor Ubu don’t even have it. Although I vaguely remember hearing within the last year or so that Taylor Mead was even still working on a new soundtrack to the film. Maybe he’ll do something with it. – would love to hear more about Ron Rice. He may be a relative (not sure). I am the great nephew of his late widow and have come across many pictures of ron rice. To my knowledge they are being given to his nephew and a film museum in new york.